With the general election approaching and dominating the news agenda, one major issue that is currently being discussed is how the result will impact on business. Several high-profile business leaders have already made clear where their allegiances lie. Most prominent among those who have spoken out is Boots Italian born chief executive Stefano Pessina. He said of a potential Labour government; ‘If they acted as they speak, it would be a catastrophe’. Mr Miliband responded by highlighting the fact that Mr Pessina is Monaco based and that Boots has moved its formal tax residence from Britain to Switzerland. So what does this mean for Boots itself? A traditional staple of the British high-street and a much-loved brand, are potential customers going to be alienated by Pessina’s stance? YouGov BrandIndex data indicates that in the immediate aftermath, the comments have had a negative impact. YouGov’s Buzz Score metric measures whether a respondent has heard anything negative or positive about a brand in the past two weeks. Our data shows an overall fall in Buzz among all respondents from +8.2 at the start of January, to a low of +1.6 at the beginning of February. The more pertinent data is revealed when comparing scores by political party allegiance. The score among those who align themselves with the Labour party shows a particularly dramatic decrease. 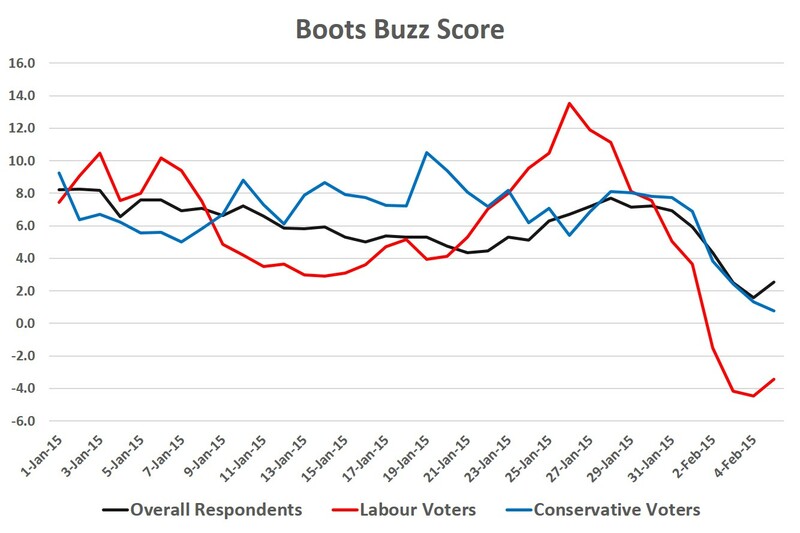 Boots had shown a score of +13.5 prior to Pessina’s comments, before dropping to a low of -4.5 in the aftermath. Among Conservative voters, there was still a drop off, although not as dramatic, this time the score dropped from a high of +10.5 to +0.8. Now while Boots will be confident they will recover in the months ahead, the data does raise the issue of whether such high profile business leaders should become so entrenched in political discourse when there is a risk of negative headlines that could distance the company from a good proportion of its customer base. Coversely, business leaders who are in part responsible for the livelihoods of a large number of employees may feel it is their prerogative to speak out should they feel that those jobs may be threatened by a change in policy from the government. The issues of business and tax will no doubt be central to the narrative until May, and how the public side on the issue will be a contributor to the final result.